How far into your life are you willing to let Amazon reach? You have your library locked in on Kindle, and your DVD collection was replaced by Amazon Prime, your music is in their cloud, your website is hosted in their cloud, you do your weekly shop through them, you maybe publish through them. You have their speaker or their camera in your home, maybe their phone in your pocket. Everything to everyone. You probably generate something slightly larger than a data-stream with Amazon, and where does that all pool? Alexa wakes you in the morning, and turns on the lights in your home, while setting your coffee to boil. You have added something to your To Do List and Alexa reminds you. You are out of some groceries, so you tap the Dash Buttons and Alexa lets you know your order has been picked, packed, and shipped. Later that same day a drone arrives with a parcel. You need to have someone do some maintenance so click to order them and when they arrive they use your Amazon Key to let themselves in. You’re out jogging on your lunchbreak, listening to your Echo portable speaker. Your life is a frictionless Amazon branded experience. Some of this really does play into the fantasy that I and a lot of others have had since watching Batman and Star Trek as kids, where technology handles all of the boring stuff so that we can do all the exciting stuff. But we also live in a world where Alexa has civil rights, and Alexa has been subpoenaed to give evidence of what was recorded in the house where it was recording all the time. Sometimes paying attention to the boring stuff means you don’t end up in Room 101. I really hate to be a party-pooper where I used to be an early adopter, but looking at the potential for erosion of human rights that is starting be pushed even harder than it was before on the digital front. Look at the security issues we have already experienced in terms of personal data being breached. Criminals tend to be more than a little ahead of the curve when it comes to identifying and exploiting weaknesses in a system, so at the moment, maybe in its early stages, it is not something to run headlong into. I feel like anything that gathers data is starting to perhaps become more of an albatross than a boon at the moment. It might be better if we were looking at open systems with the right amount of transparency, but it is more like the movie The Circle than we would like, with the gatherers of the data distinctly reluctant to disclose exactly what is done with the data collected. Everyone knows the data is valuable – all the companies out there are courting you for your allegiance and your hard earned dollar. Look to the ballooning size of the NSA. Observe the financial interests nakedly on display as net neutrality is bludgeoned to death by lobbyists. 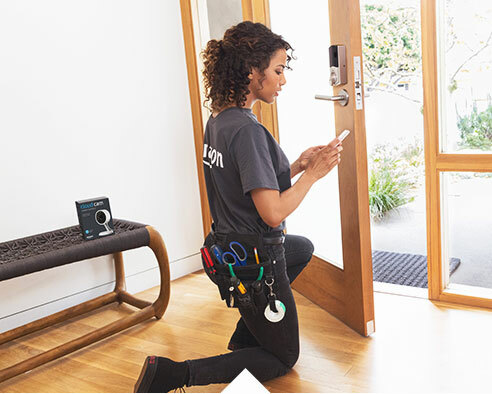 So, Amazon Key, which consists of a camera and an electronic lock, that will allow Amazon to deliver just inside your door is something I am totally not sure about. I have had reservations about the surveillance capabilities of Echo. Not so worried about a private drone army (they thankfully aren’t being called Amazon Skynet as far as I am aware). A lot of tech of late has this double-edged sword aspect to it, where it makes things easier, but creates potential problems that a simpler tech-free area never had before. Back in the 90s you wouldn’t have got much more than a rudimentary address book and perhaps badly formatted pictures if you had taken my phone from me. If you had wanted to get all the data that passed through the portal of my computer you would have had to scour through my floppy discs. I’m old enough that before that you’d have been thumbing through files and reams of paper. Now? My phone backs up into the cloud. My phone syncs with my computer. My Fitbit syncs with the phone. My weighing scale syncs with my Fitbit and my phone. My Google activity shows where I travelled, what apps I used, and every single web page and account that I accessed through my synced Google account, that plugs into every Chrome Browser I am on. When I sit, sleep, eat, read, watch TV, walk anywhere, shop anywhere – it all gets recorded. Triggers cascade actions throughout my sphere of influence all the time. And now I am going to add my home security into the mix? Exactly how does one disappear off the grid anyway? I say this like I would want to – like I would give up everything this technologically assisted life brings. I wouldn’t. But this has more often than not hinged on a notion of freedom and privacy. If I invite vampires in and I get bitten I have only myself to blame, but if they enter without my consent, that’s an entirely different matter. My wife said “cool” when I sent her the link for the Amazon Key promo, and I had that initial reaction too. I really wish I could just have that feeling, but where is the crawlspace in the era of sousveillance?